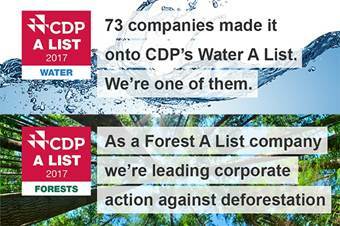 (UPM, Helsinki, 25 October 2017 at 09.30 EET) - UPM has been positioned on this year's A List for water and forests by CDP, the non-profit global environmental disclosure platform. CDP's A List comprises companies from around the world that have been identified as leading in their efforts and actions to combat environmental risk in the past CDP reporting year. Of the companies that submitted information, UPM is one of the only four companies to score an A on both water and forests. "UPM is committed to the internationally accepted principles of sustainable forest management and to minimise the negative impacts of its operations on water resources," says Tuomas Niemi, Manager, UPM Environment and Responsibility. "We aim to maximise our total contribution to society by creating long-term profitable business with responsible practises embedded into our operations and value-chain", Niemi continues. "Congratulations to all the companies that made it onto the A List this year. It's inspiring to see so many taking bold action to mitigate environmental risks and grasp the opportunities that come with the transition to a sustainable economy. These companies are driving the transition as we approach a tipping point on environmental action", says Paul Dickinson, Executive Chair, CDP. CDP publishes A-D scores across climate, water and forests for over 3,000 major corporates, with the leaders celebrated on the A List. This is the first year that CDP has announced company scores across all three areas simultaneously, reflecting a holistic approach to corporate sustainability. Thousands of companies submit annual environmental disclosures to CDP for independent assessment at the request of 827 investors with assets of over US$100 trillion. CDP is an international non-profit that drives companies and governments to reduce their greenhouse gas emissions, safeguard water resources and protect forests. Voted number one climate research provider by investors and working with institutional investors with assets of US$100 trillion, we leverage investor and buyer power to motivate companies to disclose and manage their environmental impacts. Over 6,300 companies with some 55% of global market capitalization disclosed environmental data through CDP in 2017. This is in addition to the over 500 cities and 100 states and regions who disclosed, making CDP's platform one of the richest sources of information globally on how companies and governments are driving environmental change. CDP, formerly Carbon Disclosure Project, is a founding member of the We Mean Business Coalition. Please visit www.cdp.net or follow us @CDP to find out more.